Kiwame 6.0″ Rose Gold Hair Scissors VG-10 Super Steel Cobalt shears. This is the Kiwame 6.0″ Rose Gold Hair Scissors VG-10 Super Steel Cobalt Shears with the ergonomically comfortable offset grip, featuring the ultra sharp slide cutting convex edge made from the highest Quality Authentic Japanese VG-10 Super Stainless Steel & Cobalt Alloy (Rockwell Hardness of 62+). VG-10 (also known as V Gold 10 “gold” meaning quality) is a unique formulation of steel with a high carbon content, and containing the following: Chromium, Vanadium, Molybdenum and Cobalt. 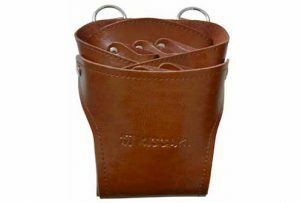 The steel is specially designed for high-quality and coated with our beautiful and popular Rose Gold Titanium. 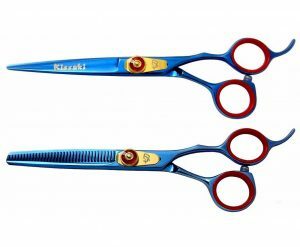 The Kissaki cutting blades are shaped using CNC technology, which allows for very fine tolerances in grinding and sharpening of hair shears and then hand honed to achieve precision tolerances not otherwise attainable on a normal convex edge. 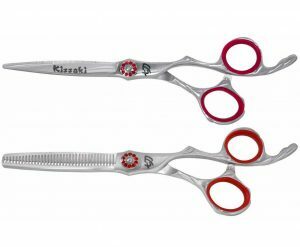 These professional hair cutting shears also feature our ultra smooth custom Damascus Steel Ball bearing tension adjustment system, for the most comfortable feel for making the perfect cut. 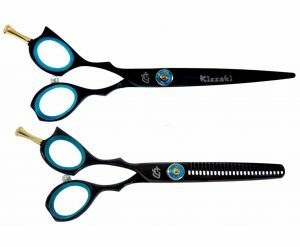 This Kiwame 6.0″ Rose Gold Hair Scissors VG-10 Super Steel Cobalt Shears is a Premium Hair Cutting Shears for the Professional Hairdresser who will only accept the best. 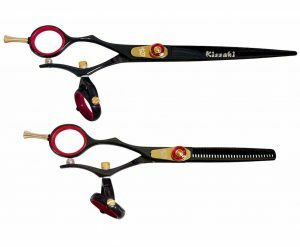 All Kissaki Hairdressing Scissors are Lifetime Guaranteed and come with our beautiful custom shears case including lubricant, finger sizing ring inserts and a leather cleaning – polishing cloth.